Steve Lee is the primary faculty advisor for the Carnegie Mellon Solar Decathalon teams. The international collegiate competition is sponsored by the Department of Energy and run by the National Renewable Energy Lab. Carnegie Mellon was selected to compete in 2002, 2005 and 2007. Carnegie Mellon’s team is an interdisciplinary mix of students, faculty and staff from the Schools of Architecture, Art, Design, Drama as well as engineering and business students, plus students from University of Pittsburgh and AIP. 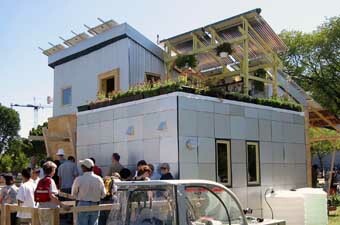 The competition is a two-year long process in which teams design, construct and operate solar-powered houses while complying with the 10 contests criteria that comprise the competition. For two weeks, a village of solar homes is on exhibit on the National Mall in Washington, DC to public visitors, numerous government and industry representatives along with media representatives from all over the world. 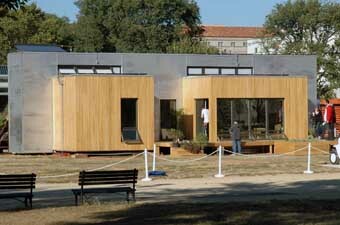 The 2002 house was a hybrid construction – part modular and part panelized. The house was an urban infill design of two stories, with a green roof patio and a shaded south-facing porch. It was fabricated of student-made structural insulated panels of light gage steel, denim insulation and environmentally-friendly OSB. The systems included a bamboo access floor, plug and play connectivity, modular homerun plumbing, energy recovery ventilation and a water-source heat pump using water tank to simulate a ground source. The house integrated a 6 kWp photovoltaic array and 6 square meters of solar thermal evacuated glass tubes. 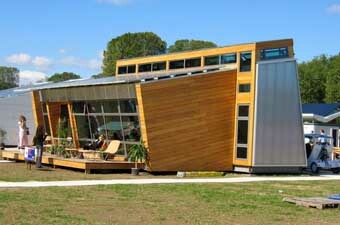 The 2005 house was an evolution of the previous hybrid construction system. The house was again an urban infill design of two stories with a lofted bedroom and mechanical space and a shaded south-facing porch. It was fabricated of OSB SIP’s. The systems included a 4-inch flyash concrete slab with embedded PEX tubing for radiant heat, plug and play connectivity, modular homerun plumbing, energy recovery ventilation and a high efficiency air-to-air heat pump. The house integrated a 7 kWp photovoltaic array and 12 square meters of solar thermal evacuated glass tubes. The structure was re-opened on the Carnegie Mellon campus as the home of the Remaking Cities Institute. The 2007 house was a fully modular construction system based on the served/servant principle articulated with the spine and pods. The house, called TriPod was designed to maximize flexibility and adaptability. It was fabricated from Versa-Wall R-30 steel insulated panels with rainscreen. The systems included green roofs, Energy Star TPO roofing, high performance glazing, radiant floor heating, VRFZ heat pump, an ERV and high-efficiency T5 and LED lighting. The house integrated a 7 kWp photovoltaic array and 2 square meters of solar thermal evacuated glass tubes. After the competition, the house was rebuilt at Powdermill Nature Reserve to be a part of their sustainability programs.